---Arena Report from this past Saturday night in Ripley, TN. ----125+ in the building...Dustin Baker opened the show and did a great job getting the crowd going…Jacobs continues to get in BETTER shape. He was the biggest guy in the dressing room...Devonci is aka Oz. He was doing a gay gimmick at NBW, but has refined it to a "Ladies Man" gimmick. He is a hard worker and the gimmick fits well...I was surprised to see them put the title on Devine and guess who was more surprised?? Devine! LOL He didn't know he was winning it until he pinned Seth. I actually wrote down in my notes - "looked like he was legit surprised". LOL Devine continues to improve, but still seems to get in a hurry…Knight is out for a while with his body needing a rest. The storyline is Rude jumped him causing the injury to the arm and putting him out...Nashville based guys have a hard time winning RRO awards, but Haskins should be considered in Most Improved category this year. 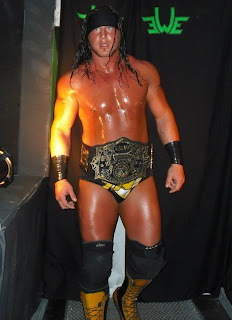 He is one half of the SAW tag champs with DKE [Derrick King Enterprises] and just fits in the heel role...This was my second time seeing Genesis. He worked the last Jonesboro show I attended. He has improved since then and has a great look!! Unbelievable abs!! Genesis and Stevens actually came in the front door [before the show] and went around saying hello to all the fans. This was a perfect way to get over at a show you have never worked at...SAW returns on 10.23.10 and RRO plans to be there...Bandana is solid and would fit perfect into a mid-card tag team with a partner doing a similar gimmick...I am saying something here that EVERYONE knows, but Chase Stevens needs a JOB with either TNA or WWE! This guy is so flawless and just a solid worker. It is sad that neither organization can find a role for him. He also came out to “Bad Company” by Five Finger Death Punch, so he was over with me. LOL…SAW promoter Paul Adams is someone you really want to see succeed. The product is “old school”, but all the guys look like wrestlers and I heard more than one of the guys say they loving working SAW because they don’t have to worry about who they are working. The roster is full of workers and guys that look like wrestlers. Adams is also a dying breed in the sense of promoting wrestling is what he does for a living. There are very few promoters out there that just PROMOTE…The SAW TV show can been at 10:00 PM on www.wvvh.com on Fridays when it simulcasts the show…Thanks to EWE/SAW cast and crew. Fun time was had by all!